Virgin America has maintained a reasonably solid passenger unit revenue performance in 2015 even as it is exposed to two region in the US domestic market where pricing pressure has ensued – Dallas and New York. The airline is joining the majority of its US airline peers in forecasting a unit revenue decline in 3Q2015; but Virgin America is also expressing optimism about 4Q2015 as it starts to lap the industry capacity increases in areas where it has faced heavy competitive pressure in 2015. During 2H2015 and into 2016 Virgin America’s capacity is ratcheting up as the airline adds a total of 10 aircraft to its fleet during that time. For now, Virgin America holds a positive view about the revenue environment in 2016, and is confident that its capacity should be favourably absorbed. Virgin America’s passenger unit revenue (PRASM) increased 0.5% in 2Q2015, buoyed in part by a USD3.2 million positive adjustment for a deferred revenue balance from the company’s Elevate loyalty programme. Absent that adjustment, Virgin America’s PRASM would have fallen by 0.4% for 2Q2015, which is still better than the majority of US airlines. JetBlue has been the only other US airline to post positive 2Q2015 PRASM, with growth of 1.4%. Similar to JetBlue, Virgin America did not face revenue pressure from the USD appreciation against most global currencies and falling fuel surcharges. Those items were solid contributors to low to mid single digit declines at American, United and Delta. Virgin America CEO David Cush stated that the company’s favourable PRASM performance was split evenly between load factor and yield. The airline’s load factor in 2Q2015 notched up 0.2ppt to 85.1% and yield increased 0.3%. The airline’s unit revenue performance was more impressive given that it is exposed to two regions that have been hotspots for competitive capacity additions, Dallas and New York JFK. The pressure from Dallas stems from the lifting of the Wright Amendment at Dallas Love Field in late 2014, giving Southwest the freedom to add numerous longer-haul markets that were previously prohibited by the regulation. Virgin America also added capacity as it shifted its operations from DFW to Love Field in late 2014. Southwest’s push from Love Field has resulted in pricing dilution in Dallas, which has pressured the performance of airlines with a large presence in the market. Dallas/Fort Worth is American’s largest hub and Love Field is Virgin America’s third largest base measured by seat deployment and frequencies offered (3-Aug-2015 to 9-Aug-2015). Previously, Virgin America has cited double digit fares from Dallas to New York LaGuardia and Washington National to illustrate some of the pricing pressure in Dallas. During 1Q2015 the airline’s unit revenues in Dallas fell 19% compared with its performance from DFW to Los Angeles and San Francisco the year prior. Virgin America recorded some slight sequential improvement in its Dallas unit revenue performance during 2Q2015, recording a 17% decline year-on-year compared to its DFW route performance the year prior. In addition to moving its service from DFW to Los Angeles and San Francisco to Love Field in late 2014, Virgin America added flights to Washington National and LaGuardia, and introduced new service to Austin in 2015. Mr Cush estimated industry capacity in Dallas Love Field is rising roughly 31% in 3Q2015 versus 32% in 2Q2015. And, to increase the heat, on 9-Aug-2015, Southwest announced "the carrier's most robust schedule ever offered at Dallas Love Field, with 180 daily departures to 50 nonstop destinations". During 2Q2015, Virgin America’s load factor on its routes from Dallas was 79%, roughly 6ppt below its system average. The company sees some upside in Dallas beginning in 4Q2014 when the competitive capacity additions begin to annualise year-on-year. However, even if pricing bottoms out or slightly improves in Dallas, the fare environment will still be solidly below historical levels, which results in airlines with a larger reliance on the Dallas market facing a very slow yield recovery. Virgin America’s other challenging region throughout 2015 has been in the New York transcontinental market, which is an important region in Virgin America’s network. 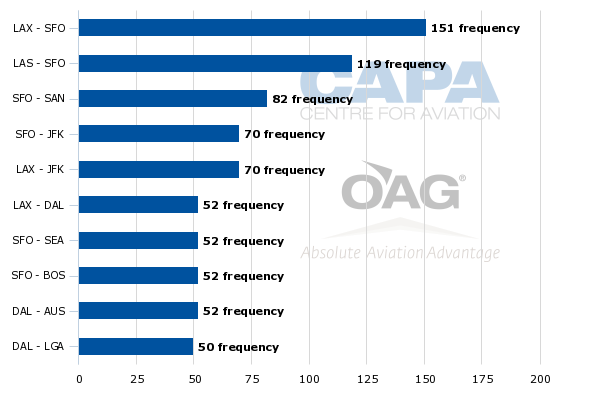 San Francisco to JFK and Los Angeles are the airline’s top two domestic markets measured by ASMs and the fourth and fifth largest measured by frequencies. The airline has been pressured by the introduction of JetBlue’s premium product Mint, which has introductory pricing of USD599. Mr Cush observed that loads in Virgin America’s JFK markets were roughly 90% in 2Q2015, and coach class yields have “held up pretty well” despite the capacity increases from JetBlue and other airlines. Virgin America’s passenger unit revenues on its JFK routes fell 8% year-on-year in 2Q2015. Virgin America only has eight first class seats on its Airbus narrowbodies, but Mr Cush noted that the airline typically operates a full-revenue first class cabin with no free upgrades. He stated that market yields in first class seating are down 30% to 40% since the introduction of Mint pricing. “My gut feel is that’s a bit of a new normal that everyone in the industry should probably get used to,” Mr Cush stated. Similar to Dallas, Mr Cush sees some upside to the pressure in New York, noting that 2Q2015 would be the low water mark for the industry at JFK “and we expect some modest PRASM strengthening as we start to annualise the JFK capacity growth in the second half as well as annualise the impact of new first class products that have come into the market”. Virgin America estimates that roughly 66% of its capacity in 2Q2015 was deployed outside of JFK and Dallas, and calculated that system PRASM outside those markets increased 5% in 2Q2015. The airline recorded a PRASM improvement in 15 markets, was flat in two and down in the low single digits in eight markets. The airline concludes that 3Q2015 is a peak for competitive capacity additions in its markets, and as as result, estimates a 2% to 4% decrease in PRASM year-on-year. Mr Cush noted that ULCCs Spirit and Frontier are adding some capacity in Virgin America’s markets, and highlighted pricing actions from Spirit and American as some drivers of the the negative PRASM estimates for 3Q2015. Virgin America has a seemingly positive outlook for 4Q2015 as some of the competitive capacity increases in its markets become annualised, but its refraining from offering PRASM guidance for that time period, other than it should compare favourably to the estimated decrease 3Q2015. After flat capacity growth in 2014 and a modest 0.7% rise in 1H2015, Virgin America is planning ASM growth of 2% to 3% in 3Q2015. The airline is taking delivery of five Airbus narrowbodies in 2H2015, four of which will be placed into service. It is also taking delivery of five additional aircraft in 2016, which is driving its estimated capacity growth of 13% to 16% for the year. The aircraft coming online will be used to launch new service from San Francisco to Honolulu and Maui in late 2015, and replace some capacity transferred to Dallas and frequency added in some markets. Virgin America cut some frequencies in its long haul transcontinental markets to fund its Dallas expansion as well as from San Francisco to Fort Lauderdale. As Virgin America’s PRASM is expected to decline and capacity increases, the airline is also projecting a hike in unit costs excluding fuel and profit sharing of 10.5% to 11% year-on-year driven by previously announced wage increases to align employee compensation with current industry averages. 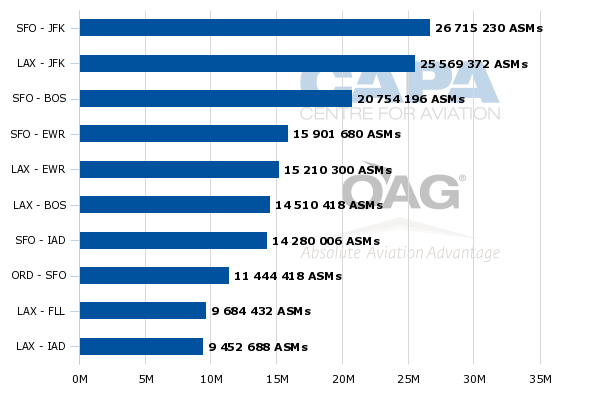 The airline estimates engine repair is also adding 1ppt of CASM increase, with another point driven by hiring and training for the aircraft coming online. Another point of the rise in CASM is driven by an 8% reduction in Virgin America’s average stage length year-on-year during 3Q2015. The CASM decline lessens in 4Q2015 when Virgin America estimates a 2% to 3% increase in unit costs excluding fuel and profit sharing. 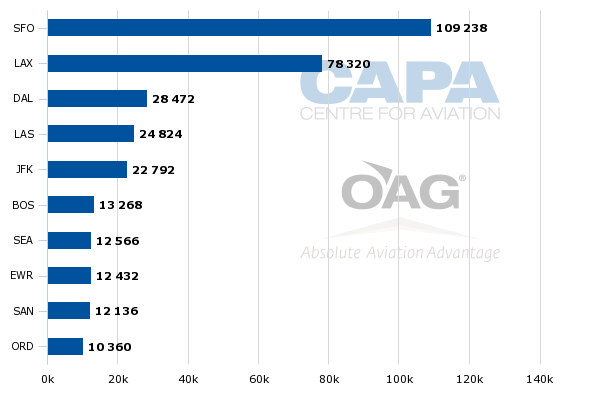 Capacity growth (more ASMs on which to spread cost) and favourable long-term debt facilities for five of the 10 aircraft deliveries in 2015 and 2016 should result in Virgin America’s CASM to decline 1% to 2% in 2016. Queried about the revenue outlook for 2016, Mr Cush concluded that Virgin America is confident that the markets where it is deploying capacity will respond favourably, and forecasts a “pretty good” revenue environment for the year. In 2013 Virgin America opted to halt its growth and rework some of its debt in order to achieve sustained profitability. An IPO in late 2014 also helped the airline to eliminate debt, and following its market debut Virgin America achieved its second consecutive year of profitability in 2014. Its profits for 1H2015 jumped from USD15 million to USD78 million year-on-year. It is a solid performance for an airline that has faced outsized competitive pressure during late 2014 and year-to-date in 2015. Much of Virgin America’s profitability during the last couple of years was a result of the slow growth and debt reduction it undertook to change its fortunes. The real test for the airline going forward is remaining profitable now that it has resumed growth. Virgin America has created a fairly solid foundation to sustain its profitability, but 2H2015 and 2016 will be telling times for the airline to prove its financial viability in a higher growth scenario.